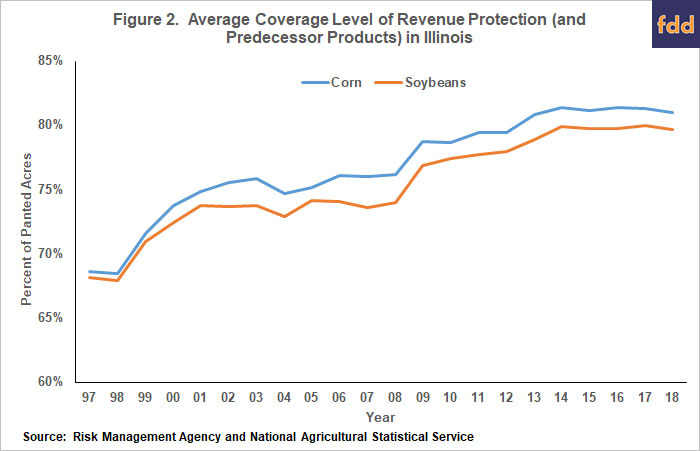 When purchasing crop insurance, most Illinois farmers use Revenue Protection (RP) at higher coverage levels for both corn and soybeans. After its introduction in 2018, Margin Protection gained acres. Tables in this article document in 2018 insurance use, as well as briefly describe changes over time. For those farmers choosing RP at high coverage levels in previous years, continued use of RP at high coverage levels seems a prudent choice for 2019. 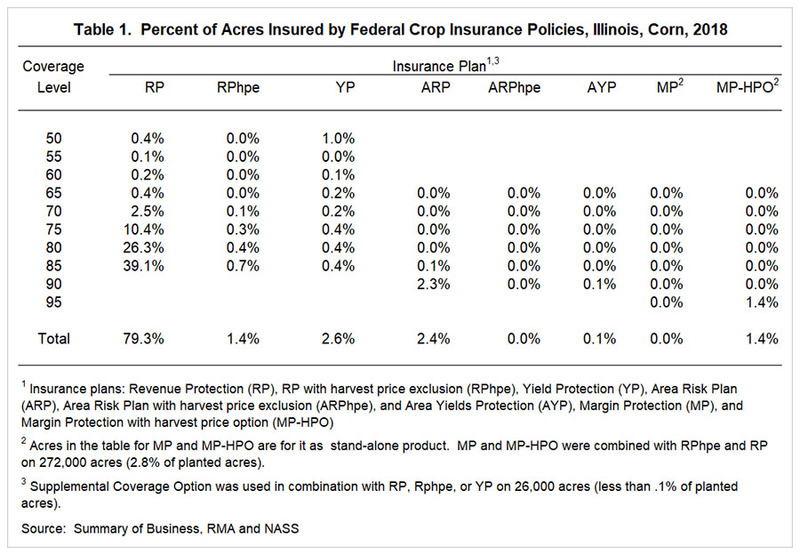 Table 1 shows the percent of planted corn acres insured in Illinois using Federal crop insurance products. These usages are given by coverage level for each Federal product. For example, RP was used on 79.3% of planted acres, with RP at an 85% coverage level being used on 39.1% of acres (see Table 1). Data in this table came from two sources. Summary of Business (SOB) statistics maintained by the Risk Management Agency (RMA) provided acres insured by product and coverage level. Insured acres in each product-coverage-combination were divided by planted acres in 2018. Planted acres came from the National Agricultural Statistical Service (NASS). By far, the product with the most extensive use is RP, accounting for 79.3% of planted acres (see Table 1). The next highest used product was Yield Protection (YP) with 2.6% of acres, followed by Area Revenue Protection (ARP) with 2.4% acres. The second and third most used products lagged by over 75 percentage points behind the RP. When using RP, most farmers purchased RP at higher coverage levels. The 75% coverage level had 10.4% of use, 80% coverage level had 26.3% of use, and 85% coverage leave had 39.1% of use (see Table 1). There is a definite, geographically pattern to coverage levels. Farmers in northern and central Illinois tend to use 80 and 85% coverage levels while southern Illinois farmers tend to use 75 and 89% coverage levels. Premiums tend to be higher in southern Illinois, leading to lower coverage level choices. Similar use exists for soybean (see Table 2). RP is used on 76.5% of planted acres. Higher coverage levels get the most use. The 75% coverage level had 13.6% of use, 80% coverage level had 26.2% of use, and 85% coverage level had 30.3% of use. Between 2017 and 2018, the most significant change was an increase in use of Margin Protection with the Harvest Price Option (MP-HP0) and a decrease in use of ARP. MP and MP-HPO were introduced as another Federal crop insurance options in 2018. NP-HP0 provides protection based on county-level margin (revenue minus costs) and can be used in combination with RP. MP can be combined with RPhpe. 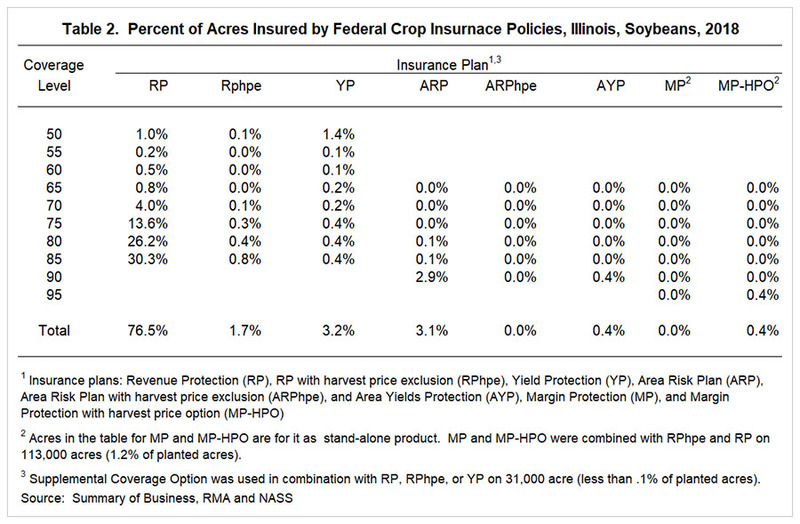 As a stand-alone product, MP-HPO was used on 1.4% of insured acres of corn (see Table 1). In addition, MP-HPO and MP were used in conjunction with RP and RPhpe on 2.8% of acres of planted corn acre (see footnote 2 of Table 1). MP was then used on 4.2% of planted acres. In 2018, an increase in use of MP-HPO and MP use on 4.8% of acres corresponds to a 2.4% decline in ARP use. Much of this decline in ARP likely is a switch to MP-HPO. In addition, MP-HPO picked up some acres solely insured by RP in previous years. Overall, crop insurance use has been relatively stable since 2013, as illustrated in Figure 1. Figure 1 shows acres insured using Federal products. 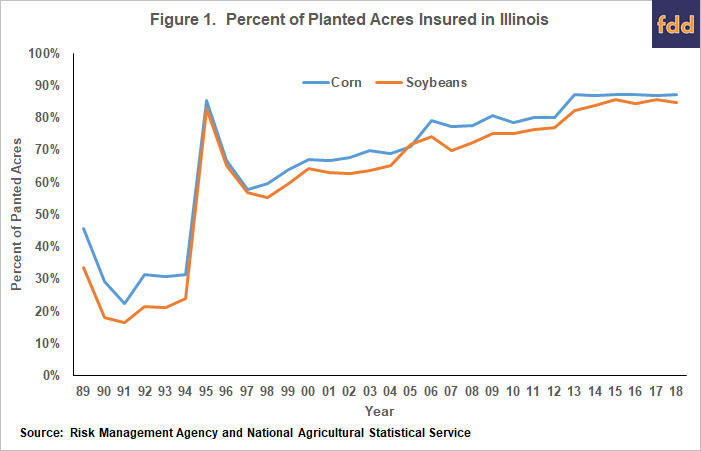 Crop insurance use increased from 58% of corn acres in 1997 up to 87% of corn acres in 2013. Crop insurance was used to insure 87% of corn acres in each year since 2013. For soybeans, insurance has been used on 85 or 86% of planted acres in each year from 2015 to 2018. Average coverage level used on RP and predecessor products has been relatively stable in recent years. Since 2013, the average coverage level selected for RP has been 81% for corn and 80% for soybeans (see Figure 2). RP is the predominate crop insurance product used for corn and soybeans in Illinois. Most farmers use high coverage levels. For those farmers using RP at high coverage levels, continuing the same choice in 2019 seems prudent. MP and MP-HPO have gained acres. A decision to purchase MP was made back in September. The only decision now is whether to combine Margin Protection with a COMBO product. That decision likely depends on increased premiums associated with adding the COMBO product to Margin Protection.